The following article is excerpted from Healthy Aging Magazine. To continue reading this article and more like it, subscribe to Healthy Aging Magazine, the lifestyle magazine that is all about following your passion and what you can do rather than what you can’t. Should You or Should You Not Whiten Your Teeth? Yellow teeth on anyone—no matter what age, gender, race, etc.—is never a good look! The first thing people notice when someone starts to speak is their mouth. If teeth look grimy, that can certainly dull the rest of the appearance of a person’s face. Yellow teeth can make a person appear to have a lack of oral and overall personal hygiene. When teeth are whitened, it brightens their whole appearance. It looks fresher, cleaner, and most importantly, can boost someone’s confidence. There are many causes to having discolored teeth. The food and drink that we consume on a daily basis has a huge effect on what color reflects on our pearly or not-so-pearly whites. Coffee, tea, soda, and red wine all have color-staining pigments that attach to the enamel of teeth, causing them to have a yellow appearance. Genetics, aging, tobacco use, and medications all play a role in how white teeth can appear, as well. These are causes that lead people into researching methods for themselves to do either at-home or in-office teeth whitening to achieve the whitest teeth possible. Teeth whitening may seem like a newer trend that is on the rise, but it is a dental cosmetic procedure that has been around in some form for centuries. The practice of whitening teeth started 4,000 years ago when Ancient Egyptians would make paste to whiten their teeth as it was a sign of wealth and beauty. Obviously teeth cleaning and whitening have advanced since ancient times, but proper oral hygiene has always been around. In terms of more recent times, teeth whitening trays and peroxide started in the ’80s. Since then, the market for whiter teeth and improving whitening products has boomed. You might be wondering why teeth whitening is so popular? The teeth whitening process is generally easily accessible, affordable, quick, painless, and has long-lasting results. 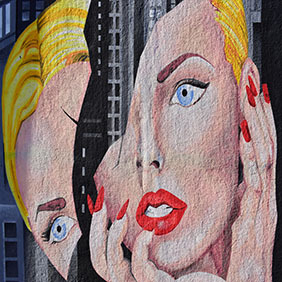 Who doesn’t love beauty-enhancing procedures with those qualities? The method you choose will determine the price, results, safety, and accessibility. The first method—that is the easiest and cheapest way—is certain toothpastes and mouth washes that have white enhancing properties. 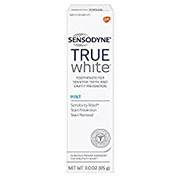 One of the best tooth-whitening toothpastes on the market and is good for sensitive or normal teeth is Sensodyne True White Toothpaste, clinically proven to be less abrasive but still effective in removing stains from teeth. 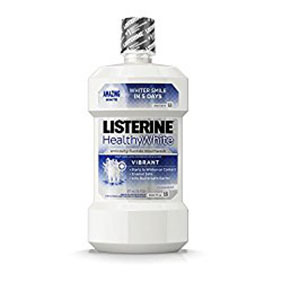 A mouthwash on the market that is well-known for whitening teeth while not harming the teeth enamel is the Listerine Healthy White in flavored mint mouthwash. Teeth whitening isn’t the only benefit from this wash. It helps strengthen enamel as well as alleviate stale breath. A brand-new oral care product that is specifically used for teeth whitening just came out called Luster Power White Deep Stain Eraser Fluoride Toothpaste. It is a two-in-one toothpaste that removes up to 95 percent of surface stains with noticeable results in as little as five days. It is formulated with 2 percent stabilized hydrogen peroxide, helping to achieve a brighter smile, and reasonably priced at $6.99 per tube. 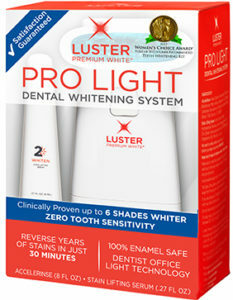 In addition to the toothpaste there is Luster Pro Dental Whitening System. Luster light pro works by erasing years worth of stains in a 30 minute whitening treatment. The treatment uses light technology that is found in dentists office in an at home kit. There are a lot of pros to this product. It is developed by dentists, you can see results in 30 minutes, it is enamel safe, and causes zero tooth sensitivity. Use a combination of the Luster Power White Deep Stain Eraser Fluoride Toothpaste and the Luster Pro Dental Whitening System and you will have everybody talking about how amazing your teeth look. Another natural teeth whitening remedy is to mix water and apple cider vinegar, using it as a toothpaste or mouthwash. The only problem is apple cider vinegar is very acidic and the PH level can damage the tooth enamel if used too often. This can lead to tooth sensitivity, but it is still an affordable way to whiten teeth. Crest is a brand that offers various whitening strip products. The prices range from $27.99 to $99.95 and the strengths of the strips vary, but all promise results. The kits they have include the classic kit to remove daily stains from wine, coffee, and food. 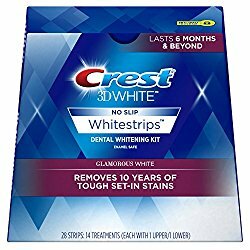 The Crest 3D White Whitestrip Teeth Whitening Kit, Glamorous White, for example, has 14 treatments for around $36. Then they have a kit so advanced that it has a laser light, used to whiten your teeth better than professionals. In addition to all the kits you can buy and apply yourself, natural remedies, and toothpastes and mouthwashes, there is in-office teeth whitening. In-office whitening will always be more expensive, but if you do not trust yourself with whitening your own teeth or do not like the DIY products in general, you can get your dentist to perform whitening treatments on your teeth instead! On average, the in-office treatments cost around $650, and the results vary from client to client. Almost 96 percent of adults believe a person is more attractive when they have a nice smile. Who doesn’t agree that nicer teeth can make a person look and feel better? If you are interested in enhancing your smile, go to your local CVS or Target to invest in DIY teeth care for at-home procedures, or contact your dentist and inquire about in-office treatments. You won’t regret having a whiter smile! Just remember that there are side effects to any kind of procedure and not to overdo it, because you do not want to ruin your enamel.